I really like skiing lift lines. Something about them is just a bit more exciting to me. Maybe it’s dropping directly down the fall line, or maybe it’s the extra pressure from above to do your best. On top of that, I’ve always had a thing for Plattekill’s Plunge. For starters, it’s a steep and narrow trail below a Hall Double. 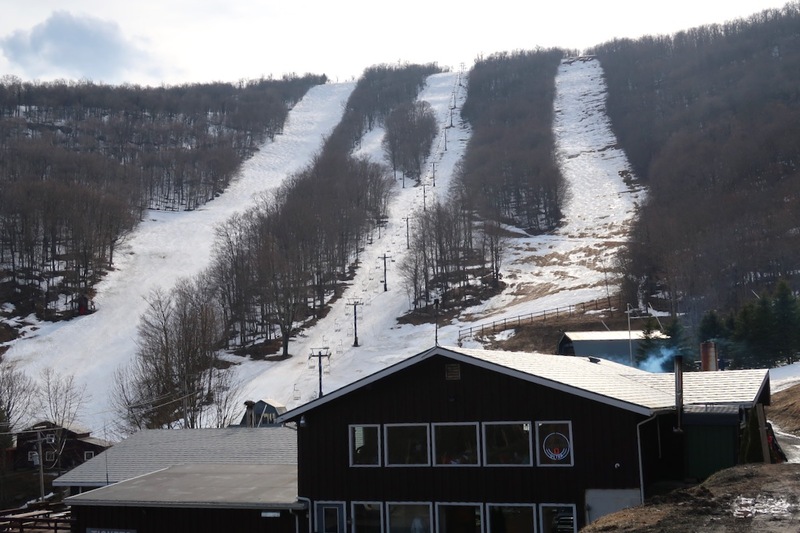 Plunge has snowmaking on its upper and lower third and is mostly all natural in the middle. 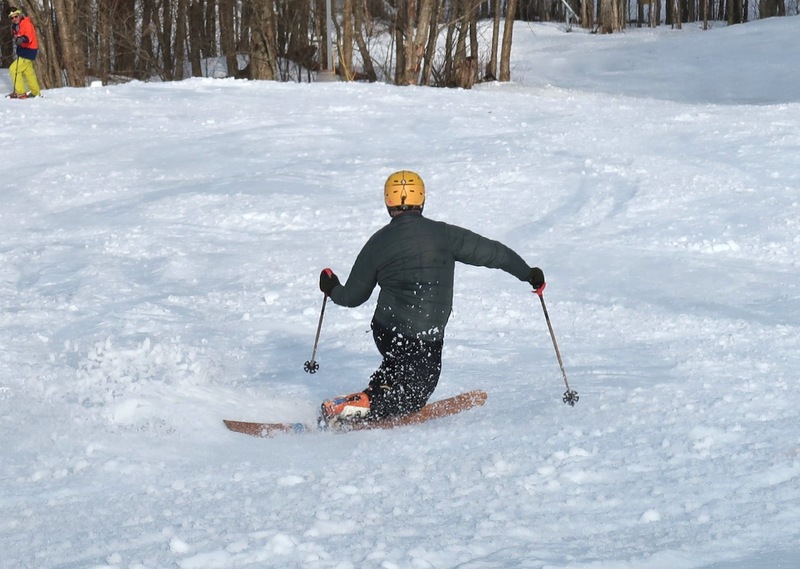 From the top, Plunge is often groomed about 60% of the way across starting from skier’s right. Down skier’s left 2 or 3 bump lines will form if given enough time. 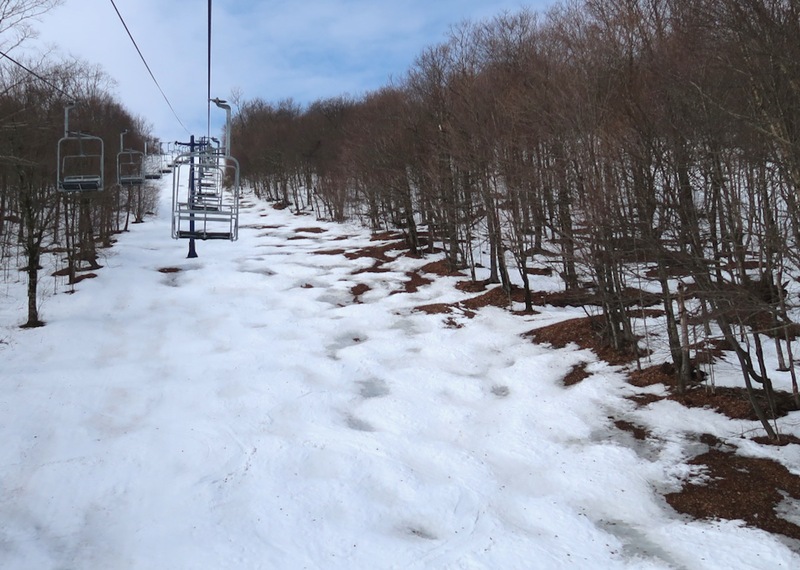 The middle — after the split with Giant Slalom — is almost never groomed. I had only one day to ski this past weekend, and all week it looked like Saturday would be the day. I watched the forecast jump from dry to wet and back to dry, as models tried to pin down the location of a front that was to be draped across NY all weekend. 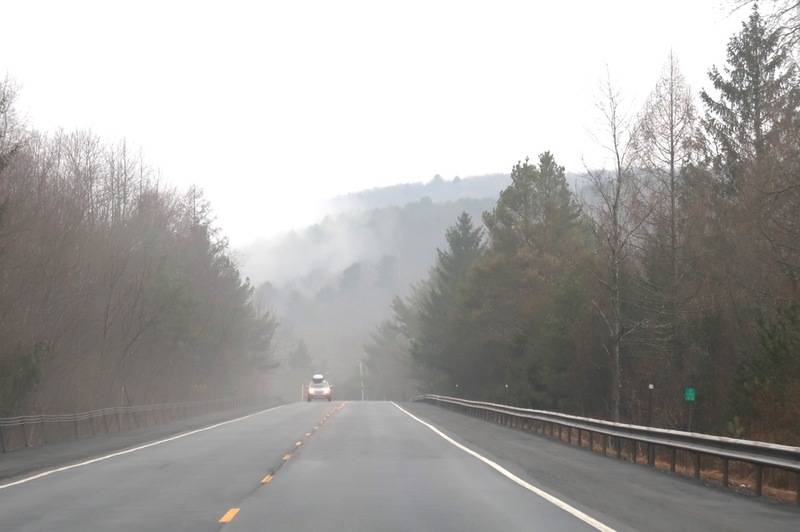 It was foggy driving through the Catskills, but when I got to the mountain it was 40 degrees and dry. I booted up and headed to the triple to meet Roman, Plattekill’s Head of Ski School, for first chair. We rode to the top and came right down Face. Things never froze overnight, so the groomed snow was soft, if a bit grabby. Off piste was even softer, but the grab factor was almost off the charts. 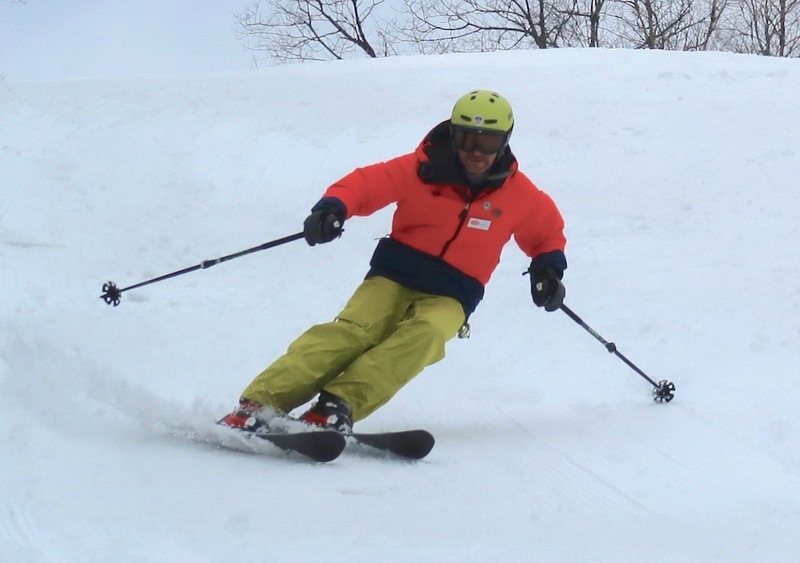 We learned quickly: skiing in someone’s tracks really helped you slide. After the recent weather, it took some time to get the ramps for the double covered in snow. When the rope dropped, we were right there. Riding up with Plunge below me, I started to think. If I could convince every one I saw to ski the bump lines on Plunge, we could get something going. “Join the Plunge Army! Twenty skiers through the bumps, and we’re in business!” To truly get busy on Plunge, I needed help, and I was begging for it. One skier asked me how many had hit it so far. The honest answer at that moment was two, and both were me. Our group began to grow as Marcski, Breck, Michele and Jean Paul joined us. At Michele’s persistent urging, we ducked the ropes to check out Ridge, but the pitch was too mellow for the grabby snow. 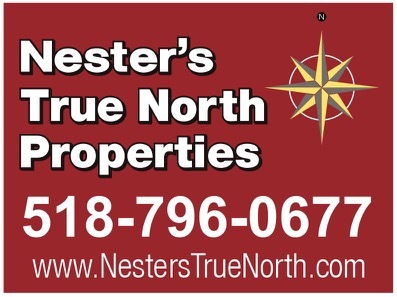 The best skiing remained on Plunge, Blockbuster and Northface. As the morning wore on we saw patches of blue sky and in the afternoon the sun broke out. Every chance I got, I lobbied for Plunge and The Plattekill Plunge Army. The direct sun really warmed surfaces, and the groomers — especially Plunge and Block — got even better. On Block we were slicing layers of corn with every turn. On our next run on Plunge, the group wanted to stay on Giant Slalom, but I tried to tempt everyone back into the ungroomed bumps. I leaped over the edge and committed 100%. The snow was grabbing at my skis, but I did not relent, somehow pounding out every single turn without tripping. I honestly can’t exactly say how I came to this break through, but it felt like a big one. I knew I nailed it when I pulled up below and saw my friends drop in behind me. By mid-afternoon conditions were so good we couldn’t pull ourselves away. I skied all day from first chair to close, including several bump runs, and I felt good about it. Roman said we did 20k in vert. Later, at the bar, Breck asked me what he could do to “help” NYSkiBlog. Great post! You nailed it about that “grabby” snow. I saw you guys from the lift in your tight formation going down Plunge but couldn’t figure out what you were up to?! I would have gladly joined the Plunge Army but I had two younger skiers in my charge. I still managed a couple of runs down Plunge, but I would send the kids off to the right side where there was more coverage, while I went over your nicely laid bump tracks on the left. Spent most of my time on Block which kept getting better as the day wore on. All in all, another epic ski outing at Platty! Great day, Harvey! I think along with the Plunge Army, the Block Brigade was in full effect that day as well! 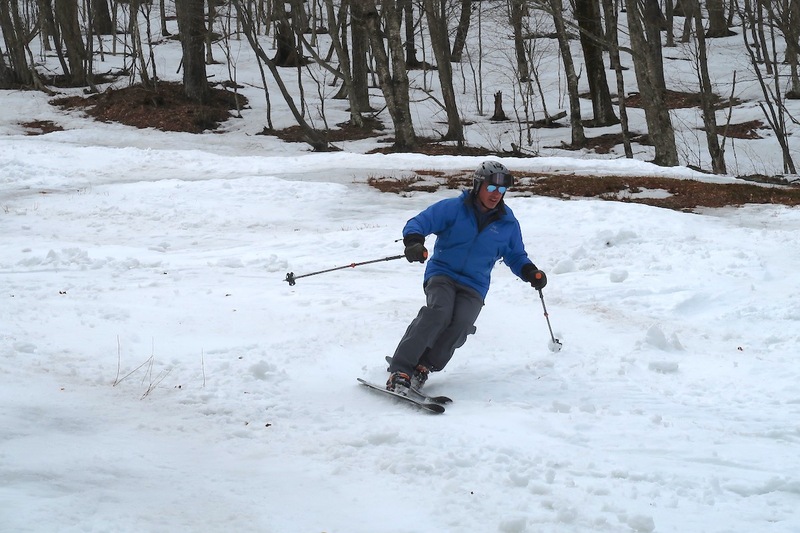 Thanks Harvey, excellent description of a fine ski day at Plattekill. Keep up the good work! only at platte. that same day, I enlisted in a group of knee dropping tele thrashers who made the sticky conditions look breezy. plunge was one of the favorites. Super fun day. Folks just don’t get that tulips coming up in the city means excellent spring skiing. We have another weekend I am guessing at Plattekill. And the best bumps were on Blockbuster. Not much snow making gets over to under the towers on Plunge so it was thin over there. Plunge is my favorite trail though. I like the way Plunge sets up. With just a little snowmaking making it over there, it’s mostly natural. And the narrower trail sets up fewer lines, so each line could (theoretically) get more traffic. I want a deep bump run with big bumps! Join the Army. Hope to see you soon Chris. Definitely a fun day. Whenever there are bumps at Platty, its always a fun day…even with the sticky snow. IMHO, the best bump line on the mountain is right under the chair on Plunge. As Harv said, its almost natural snow all the way down, has a nice grade and its Hollywood time under the chair. Especially on a powder day. Although, I have to agree with both Roman and Breck that the best bumps that day were on Block. Hoping for some cooperation with the weather for one more nice weekend! Plunge Army is too military for a free flowing run. I prefer Platty Party People Plunging. 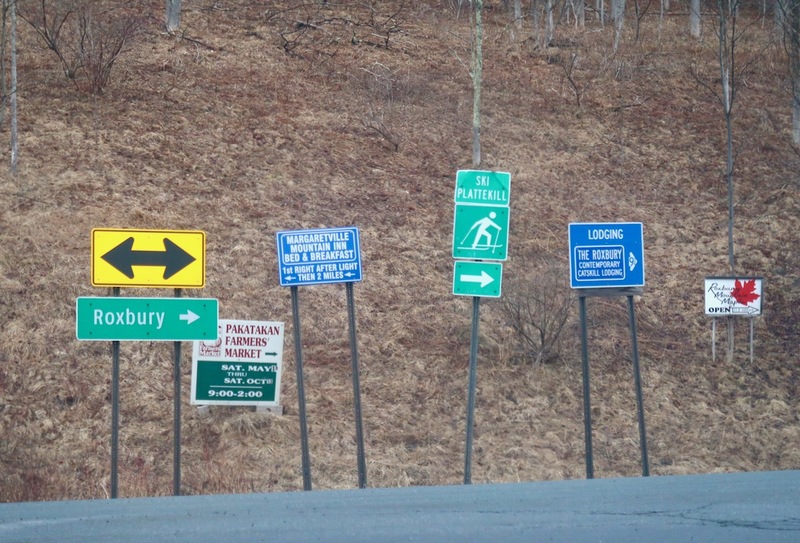 Finally got back to Plattekill – it was amazing how we were greeted and humbled by that. Thanks for this great story Harvey. One of many reasons I like Plunge; it is narrow. We can concentrate our efforts. Fewer lines, more skiers per line, bigger bumps. What I really want to ski is big bumps on the top of Plunge.